I did it! I did it! I did it! I finally finished the wedding quilt top (only a week after the wedding, whatever… it will be either a first Christmas or an anniversary gift). It’s a modified version of the Dissappearing Four-Patch from this tutorial. I used 6 1/2 inch blocks to start and sliced 1 1/4 inches on each side of the seams. I found some useful techniques while cutting these, so I may make my own tutorial later in the summer. The biggest: buy a rotating cutting mat. It makes everything so very much easier. There are some special facbrics in this quilt. In addition to a beautiful shot cotton and some great prints, there are two Spoonflower prints. A lobster print for my niece, she has a HUGE thing for lobsters and seems to have quite the collection of random lobster things, and a rooster quilt for her husband, who it seems is equally fond of roosters. A note on Spoonflower prints: they definitely print lighter than you expect. It wasn’t bad, but I was expeting more of a navy for the lobsters and it came out more of a dusty royal blue. Other than that, they are wonderful and just what I needed to make the quilt special. There is a 3 inch (finished) border of grey surrounded by 6 inch piano keys. I made the piano keys by strip piecing 2 1/2 inch strips into groups of 3-5, then cutting them down to 6 1/2 inches. Then I just laid them out randomly and got a great, easy border. 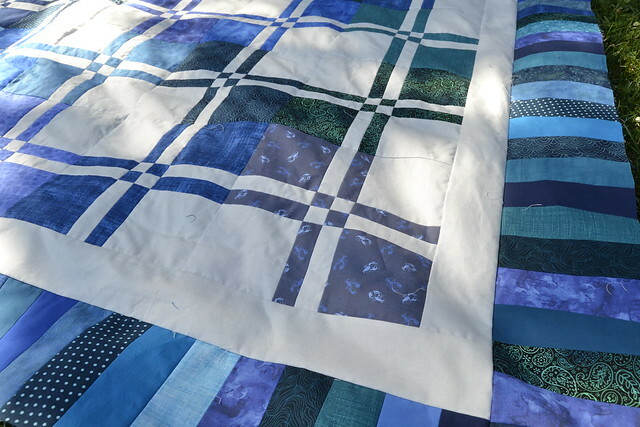 Linking up to Thank Goodness It’s Finished Friday, which is in Australia today with Audrey at Glory Be Quilter and with Amanda Jean of Crazy Mom Quilts. Great quilt! I like the border. I just finished a Disappearing 4-Patch baby quilt made from 30’s fabrics (so fast and easy). 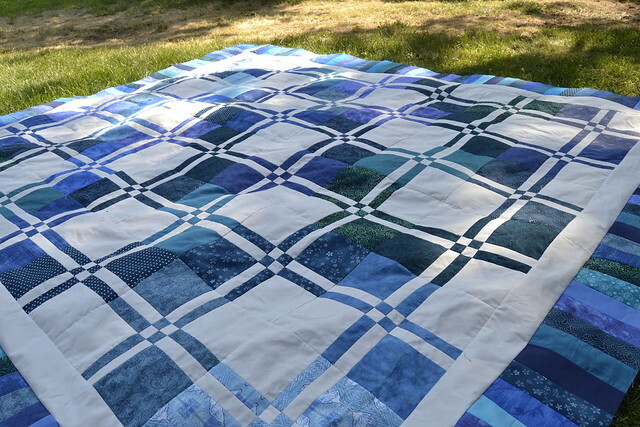 I really like the layout of your blocks; I will have to try it the next time I stitch a D4P quilt. Thanks! I do love disappearing four patches. 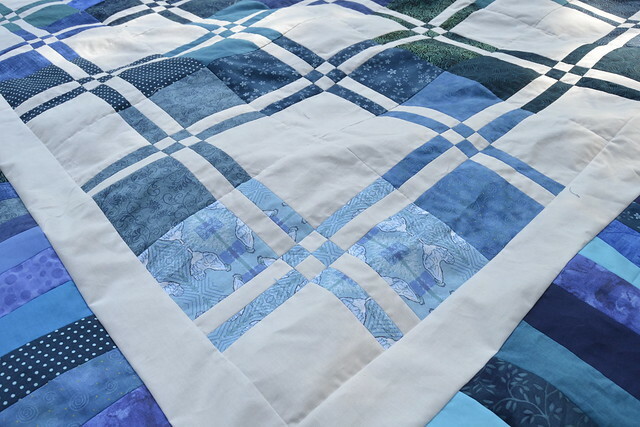 This is a lovely quilt and sure to be a treasured gift. What’s a week when they will have this forever? Thanks for linking the tutorial. I’m definitely going to have a go at one of these. Gorgeous and I LOVE the lobster print!! !